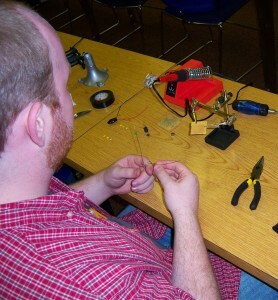 DIY Soldering Class Taught by MidsouthMakers May 14th! 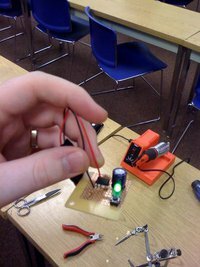 Want to learn how to solder? The Midsouth Makers group will be hosting a beginners’ soldering workshop on Friday, May 14th at 7pm in Room 241 in Nolan Hall at Christian Brothers University campus, 650 East Parkway South, Memphis, TN 38104. If you wish to buy a soldering iron it will be $10, but only $5 if you bring your own soldering iron or just want to borrow one. We are a newly founded non-profit group looking to meet, teach, and work with others on DIY projects. We will have a kit that includes a 555 timing chip and everything you need to build a small circuit that lights an LED when you press the button. All parts including batteries are included. Each kit contains the timing chip, 3 resistors, a button, 2 batteries, a LED, a capacitor, and perf board to solder everything to. So last Friday we had our very first workshop. We tried our hand at soldering. Despite a couple of burns, or two, or several, we hope everyone at least enjoyed themselves and the opportunity to introduce themselves to the world of discrete electronic components. So whether you were able to get your circuit to work or not, hopefully you at least learned how to solder. And hey, don’t get too terribly discouraged as you’ll have another shot on May 14th. The circuit that we worked on was a 555 Timer based One-Shot (see monostable multivibrator.) The purpose of this circuit is to provide a steady, constant, digital signal that goes high for a predetermined amount of time no matter what the input trigger does and then shuts off until triggered again. In other words, no matter how many times you press the button on the circuit, the output generated will remain high for the set period and go off. Once it is off you can then press the button and it will repeat the same thing again. In the electronics world this is a very important, yet simple circuit. 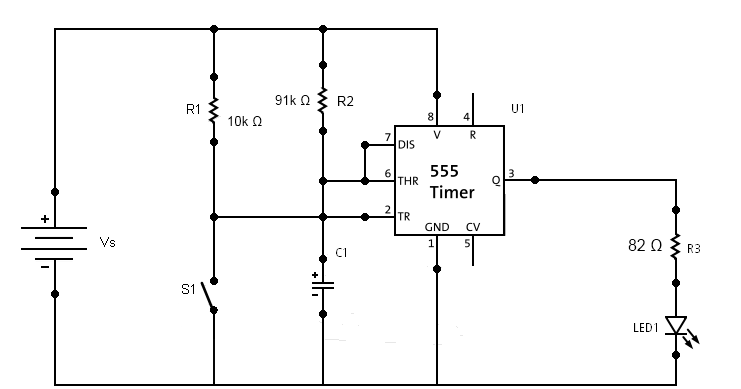 The 555 Timer is used in almost anything that requires a simple clock. Even more important for the purposes of our workshop, the circuit has several soldering points, and involves some creativity with component placement. If you have any other questions about the circuit, feel free to shoot me an e-mail at [dhess at midsouthmakers dot org] and I can attempt to explain (or confuse you) even more. The links for the circuit diagram and Fritzing file should be below. If you have any issues getting to the files, just leave a comment. 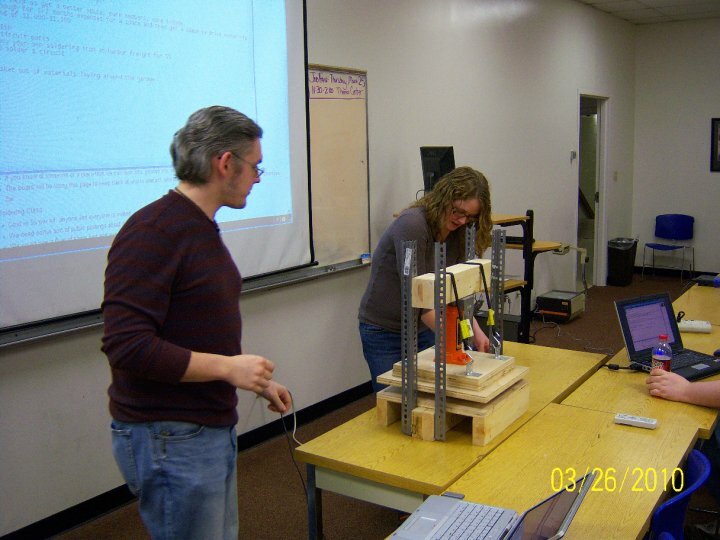 We had a great meeting last Friday, if you missed it, you missed a good time and some really neat projects. Daniel and Mary brought their Hydraulic Letterpress and some examples of the work they’ve been able to do with it. Mitzi also brought in a handmade wooden basket that Brad made out of materials laying around the garage, and Rick brought in some picaxe microcontroller stuff to show off. We look forward to seeing everyone Friday @ CBU! In case you haven’t noticed the links at the top, our wiki and forum both are now listed up there. To top things off they work too! Currently I have been primarily focused on the wiki. The main goal of it is to document any and all projects that we have in the organization, individual or group. Since we are built around open source components and basing a lot of projects off of info shared by others, it’s only fair that we do the same. This is not to say that we won’t necessarily patent any of our projects, but the ones that aren’t and maybe even some of the ones that are will be shared on there. As part of trying to get all of this up and going, I have started work towards putting one of my personal projects up. My project is currently not finished, but I do have various components of the overall project that have been completed. So that is why, the very first article on our wiki is the LCD article. So go check it out, tell what you think, and look back for more.